This is such a delicious and satisfying meal, it is one you will want to eat day after day. The flavours are at once herby, spicy and tangy with every mouthful having a little creaminess and a little crunch. 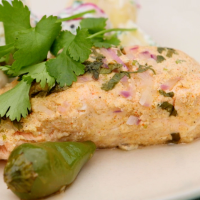 The salmon is roasted in a lovely mix of spices and yogurt and is really moreish. 1. Mix all the ingredients for the marinade and season well. It should taste tangy and spicy - the fish will absorb it and it will only have a slight coating. Add the fish, cover and leave to marinate in the fridge for at least 30 minutes, or more if you have time. 2. Remove the fish from the marinade and place on a large piece of foil. Top with the chopped coriander and red onion, and add the whole green chillies. Wrap the foil around the fish to make a parcel, then cook on the barbecue for 8-10 minutes, or until the fish feels springy to the touch. Alternatively, bake on a foil-lined baking tray in an oven preheated to 200oC, gas mark 6 for 20 minutes. 3. Serve immediately, garnished with coriander sprigs and lime wedges. See also Anjum Anand’s Three-seed potato salad.